Last week I was in work/ formatting hell, which was my own fault. Last week my brother gave me a large workload to complete before this week, because tomorrow, we are going to gather more data (insert eye roll here). So, I worked on the data during the day and my formatting during every other free time I had. I worked late very night, as expected. But what put me in hell wasn't the workload. Even though I knew exactly what I had to do with the formatting, I allowed insecurity and self-doubt to drive me to tears last week. While formatting, I had an idea to look up some formatting articles and see what they had to say about formatting your book for print in Microsoft Word. Needless to say, most people were harsh. A few people even suggested that you can't get a professional looking book using MS Word. Well guess what? I was using MS Word and even bought two e-books perfectly explaining how to format my books in MS Word. Because I didn't have enough faith and belief in myself, I allowed all my hard work to come undone, because of what a few people suggested. I should have thicker skin by now, right? Wrong! I didn't blog about my problem last week, because I didn't see why I had to infect the rest of the blogesphere with my negativity. And after many tears and sleepless nights, I made peace with the fact that I think my book looks good and that I didn't use any fancy software. Some people might feel I'm a disgrace to the self-publishing community, but I don't care. I'm happy with the final result. Having said that, I still haven't decided on a release date yet. 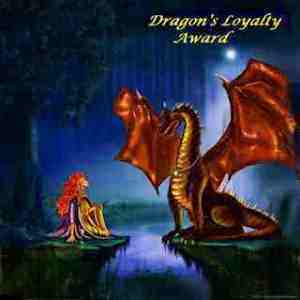 While I was losing my mind last week, Deanie Humphreys-Dunne awarded me with the Dragon's Loyalty Award. Thank you, Deanie! You are very kind. Pass the award on to 15 deserving bloggers. Let them know in a comment about nominating them. I could eat potatoes every day. I'm also not a lover of snakes, or anything reptilian. I love music. I can't imagine life without music. I've formatted 27 novels now...and learn 10 things new each time. Oy vey. Hahah! I don't mind learning new things. When I start getting contradicting advice, that messes me up. Please accept the Dragon's Loyalty Award. If it worked in Word, no worries. You're the one who has to be happy with it. Potatoes every day? I probably have onions every day. Please don't forget to accept the award, Alex. You are very deserving of it. I can't imagine that using Word would not give you a quality product. I'd say forget what "those people" said. Thank you so much! It took me a while to stick to my plan and ignore their opinions. Please, accept the award, above. If you come up with something that looks good, then I don't see why using Word should be a problem. If it works, it works! Thank you so much for your kind words. It made me feel better :) Please, do accept the award above. I'm sorry that you went through a difficult time; I know that even just a few people's comments can have a strong influence, even when we don't want them to. Just try to ignore people like that though, and do what feels right to you. I don't know much about formatting, but if I did I'd help you. Good luck! Thank you so much! You are always so kind. Please, do accept the award.